Listening to your favorite music through a pair of cheap $20 headphones is like eating your favorite food when you have got a cold. It’s just not the same! A good pair of headphones will transform the way in which you listen to your music. It’s often said that you haven’t really heard a song until you have listened to it through a quality pair of headphones. Unfortunately, the huge amount of choice can become overwhelming for consumers who don’t know exactly what they are looking for. That is why our team have done all of the hard work for you, by testing and reviewing the best headphones under $200, and narrowing the choice down to the best five. 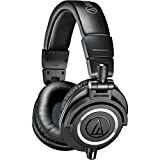 If you are in a rush, and can’t wait to pick up a new pair of cans, the best headphones that we found at this price point were the Audio-Technica M50X. The sound quality is extremely balanced and well-rounded. The lows are warm and the highs are consistent. They are everything you want from a solid pair of headphones. In order to provide you with the most helpful headphone reviews on the Internet, we sent some of the team here at Tech Spectacle on a researching rampage, to find the most important features that make a pair of headphones, a good pair of headphones. Being tech lovers, we have also owned our own fair share of headphones in the past, so we know exactly what to look for when shopping around for a new set of cans. With our list of the most important features in mind, we scoured the internet for the most up to date reviews and information about the best headphones that your 200 bucks can get you. Without a shadow of a doubt, the most important factor that you need to keep in mind when shopping for a new pair of headphones is the sound quality that they produce. Good sound quality is the main reason why we indulge in more expensive headphones. The other factors on this list will play a huge part in your final decision, but none as much as the sound quality. Music is a very delicate thing. Listening to a song through cheap headphones is in a way, insulting to the musician who made it. The amount of work that goes into creating a song is mind boggling, and the only way to really appreciate the intricacies is by investing in a quality pair of headphones. People have different preferences when it comes to music. What could be the best sound quality in the world to me, could be the worst sound quality to you. Different headphones are designed for different styles of music. Some headphones may emphasize the bass, while some may put an emphasis on the mid-range and treble. With that being said, the five pairs of headphones that we have compiled in this review are what we would consider ‘well-balanced’, and will sound fantastic regardless of the style of music you are listening to. There are a few different factors that will influence your choice of headphones, including when you will be wearing them, where you will be wearing them or simply a personal preference of a certain kind. In-ear headphones are comfortable, discreet and perfect for exercising. The sound quality tends to be warm and will generally be very bass heavy. On-ear headphones are similar to the regular “full-sized” headphones in regards to their design and sound quality. The only difference being that the ear pads are smaller and sit on top of the ear, rather than around them like the over-ear headphones. Over-ear headphones are the largest in size and the pads tend to have the most amount of cushioning. If comfort is a priority for you, then a good pair of over-ear headphones would be the best choice. Depending on how long you typically spend wearing your headphones, the comfort is a crucial feature that you definitely need to consider. Comfier headphones will allow you to enjoy your favorite music without ever being distracted by the constant need to readjust them to a comfier position. Uncomfortable headphones, especially the larger over-ear headphones have a tendency to cause a numbing pain around your ear if you wear them for too long. Not ideal for the audiophile who spends most of their day ‘plugged in’. Fortunately, all of the headphones on this list have been tested by our staff and thousands of other reviewers around the world. Whichever pair you decide to go with, we guarantee you will have no complaints. No matter how careful and diligent you are with your headphones, it’s inevitable that they will pick up some bumps and scratches over time. Whether they are crumpled up in the bottom of your bag or dropped on the floor as you attempt to plug them into your laptop, a quality pair of headphones need to be tough and rugged enough to not break after the tiniest knock. Cheap headphones have a tendency to break relatively quickly, but the more you spend, the better the build quality tends to be. For your budget of $200, you can be certain that the headphones are built to last. Everyone has their own preference when it comes to the style and design of headphones. Some like retro, classic looking cans while others prefer them to look modern and sleek. One thing is for certain, however, and that is the fact that all of the headphones on our list are what we would consider ‘good looking’ headphones. Of course, you will still have your preference, but generally speaking, you will look cool regardless of which pair you decide to go with. After careful deliberation, we decided to offer the throne of the best headphones under $200 to the ATH-M50X from Audio-Technica. If you are looking for a sound that is crystal clear, well-balanced and comparable to the higher end headphones that cost considerably more, the M50X’s are perfect for you. In terms of the sound quality, there isn’t really much that we can say to express how accurate and clear these bad boys sound. It’s worth noting, however, that these headphones do not excel in any specific frequency, so if you need bass heavy headphones, there are others on this list that are probably more suited to you. With that being said, the bass is still incredibly deep and mind melting, so don’t be discouraged. The solid sound is powered by the 45mm drivers that are equipped into each of the cups, and the earth magnets and copper aluminum wiring helps to lock in the pristine sound. The M50X’s are over-ear headphones, so they do cover the entire ear whilst wearing them, but the professional grade leather is extremely soft and will cause no issues if you need to wear them for a long period of time. The build quality is fantastic for a pair of headphones at this price range. We have handled headphones that cost over twice as much as these things and we were still blown away by how strong and rugged they felt. The base design is plain and simple, but the available color variations allow you to customize the exterior to something more up your alley. To round things up, the Audio-Technica ATH M50X headphones truly are a professional standard pair of headphones that blew our expectations out of the water. If you need the best of the best at this price point, you would be crazy to look past these. When we think of the brand Phillips, great sound quality is not necessarily what springs to mind. However, after listening to the Fidelio L2’s, our opinion has changed completely. The reason why we have included these in our top five is not only because they are a superb pair of headphones that cost less than $200, but because they compensate for the ‘not so bass heavy’ M50X’s that we previously reviewed. If heavier bass is your thing, then the L2’s are the headphones you have been dreaming of. The low-end emphasis is not an accident, either. Phillips have purposefully installed a small vent in the drivers that power these headphones, and this small vent is claimed to drastically improve the low-end frequencies. Whether this small feat of engineering is really making a difference to the low-end sound is debatable, but the incredible bass that these cans can produce is certainly not. The Phillips Fidelio L2’s are also over-ear headphones, but again, the superior levels of comfort will give you no problems if you plan on using these for long periods of time. The cushioning is made out of high-grade memory foam, and the covers are made from a soft, luxurious leather. They also have a built-in microphone, allowing you to take phone calls without having to remove them. In terms of the design, we love them. They are currently available in glossy black, with a subtle accent of orange around the edges where the stitching runs. So, to recap – If you are looking for a fantastic pair of over-ear headphones that are extremely comfortable and produce some of the warmest and deepest sounding bass you have ever heard, the Fidelio L2’s are definitely for you. On the contrary, when we think of the brand Bose, we absolutely do think of superior sound quality. It’s what Bose are known for. However, they are also known for their extortionate prices. The SoundTrue headphones from Bose are the first headphones to really showcase that Bose quality sound does not have to cost an arm and a leg. 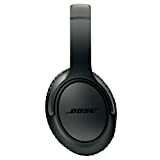 For less than $200, you can experience the incredible sound quality that Bose are world famous for. Another area where Bose are known to excel is in the comfort of their headphones. The over-ear pads and the headband work together to gently hug your head, without causing any pressure or friction whatsoever. If you need a pair of headphones that are so comfortable that you forget you are wearing them, these are the ones we would recommend to you. The build quality is on par with the Fidelio L2’s and the M50X’s, but when it comes to the design and style, the SoundTrue II’s win hands down. Bose headphones jut scream ‘cool’, and with a multitude of different colors to choose from, you can choose a style that suits your personality down to a T.
These headphones are built to last, so if you need a pair of headphones that are comfortable, have tremendous sound quality and will last you for years to come, here they are. Another brand that is universally known for its excellent sound quality are Sennheiser. The HD 598 headphones are an absolute dream for any audiophiles who loves to hear every intricate detail in their favorite songs. If you have only ever used cheap headphones in the past, you will be blown away by the sound quality of these headphones. The over-ear headphones are available in black or ivory, and the velvour covered ear pads are literally to die for. Sennheiser went against the grain with the material of these ear pads, but they definitely pulled it off. One thing to keep in mind is that the HD 598’s are open backed headphones, which have been known to leak a considerable amount of sound. If you don’t want to disturb the people around you, there is also a closed back version available. What surprised us the most with these Sennheiser cans was the ability to use them on almost any device. The 1.2m long cables are equipped with 1/4” plugs out of the box, but Sennheiser are kind enough to include a 3.5mm jack extension if you will be listening to music on an iPod, phone or laptop. If you are looking for a solid pair of headphones from a reputable brand, then we would highly recommend the Sennheiser 598’s. Last bust not least, we have the PRO 2 headphones from Plantronics. The relatively unknown brand Plantronics have surprised us time and time again with the quality of their headphones. We will admit, we were a little bit hesitant about recommending these, but once we gave them a run through our tests, there was no way we could keep these from you. What’s so great about these headphones is that they are completely wireless, but they also come with a 3.5mm cable to convert them to wired if you ever want to. The wireless capabilities are fantastic on these things. With a 24-hour battery life and a range of up to 100 meters, you can listen to these all over the house without fear of them cutting off. The headphone casing is equipped with all of the controls you need, including volume, pause/play, Siri/Google assistant and much more. They are also noise cancelling, unlike the other headphones on this list. Perfect for listening in busy public areas, or on an airplane. The design is very modern and sophisticated. In our opinion, they are the best looking headphones on this list, but we will let you be the judge of that one. So, if you are looking for a well-rounded, wireless pair of headphones that will completely exceed your expectations, we would highly recommend the Plantronic PRO 2’s. When we were tasked with the challenge of finding the best headphones under $200, we thought we would be struggling to find any worth writing home about. However, the amount of choice we were given at this price point was surprising and overwhelming to say the least. The best pair of headphones that we managed to find at this price point were definitely the Audio-Technica M50X’s. They are comfortable, have a well-rounded sound and they are built to last. They are everything you need from a pair of headphones. With that being said, if the M50X’s do not tickle your fancy, then the other four pairs that we reviewed are still an incredible choice. We would recommend each and every one of them. What factors turn a pair of good headphones into great ones? Find out in this review of the Best Headphones under $200 this year. The Audio Technica ATH-M50x is definitely among the best studio monitoring headphones on the market, and undeniably the best in its price range. I wasn’t actually expecting much when I first got it. I initially thought it wasn’t worth all the hype, but I went ahead and gave it a try anyways just to see what it’s capable of doing. And I’m very glad I did. It’s been a couple of years now since I purchased it, but it still impresses me. The quality is excellent, it sounds great, and it remains comfortable even with prolonged usage. I highly recommend it.